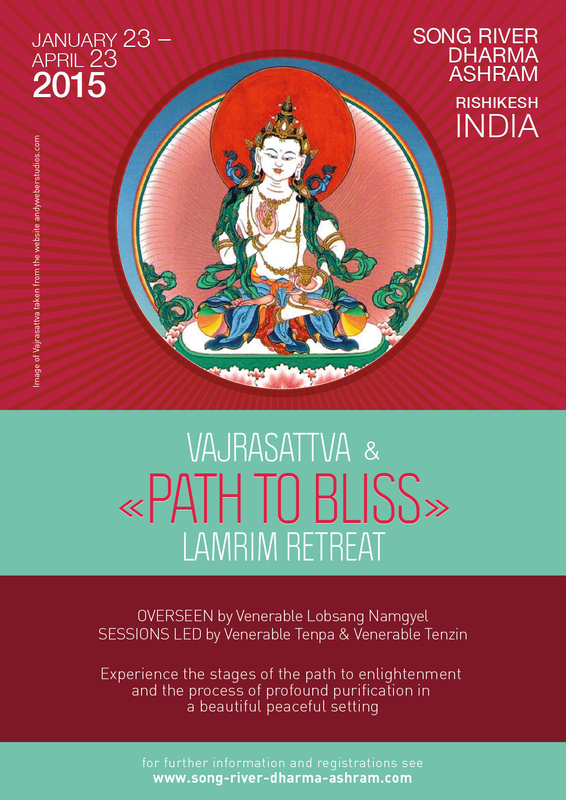 January 23 to April 23, 2015 : a three-month retreat on the purificatory practice of Vajrasattva and meditations on the path to awakening on the basis of the First Panchen Lama’s classic «Path to Bliss» text. The retreat is dedicated to the intense practice of the purificatory method of Vajrasattva and gradual meditations on the path to enlightenment which gradually transform the mind; each day of retreat includes 4 sessions of intenisve group practice, as well as additional types of activity aimed at deepening the inner experience. The retreat is bilingual (for English- and Russian-speakers). * «Path to Bliss» (Tib. Lamrim Delam), also known as «The Easy Path» is a quintessential text by a great master named Panchen Losang Chokyi Gyaltsen which includes key instructions on the mind-transforming meditations on the stages of the path, taken from the secret ear-whispered tradition (Tib. Ganden Nyengyu) of the great scholar, yogi and teacher Tsongkhapa Losang Dragpa. Participants are accommodated in single or triple rooms (12 single rooms and 2 triple ones). The cost for accommodation and meals (in case of early registration) is 1000 Euro for single accomodation and 900 Euro for those living in a triple. The cost only includes accommodation and meals and is not an offering to the monks of any kind. A pre-payment of 400 Euro is to be done in September. Unfortunately, this is non-refundable (however, you might give your place in the retreat to somebody else). The participants are provided with all the necessary learning and practice materials, including teachings on the practice of Vajrasattva given in different years by Lama Thubten Yeshe, Lama Zopa Rinpoche, His Holiness the Dalai Lama, Venerable Thubten Chodron and other prominent masters of the Tibetan tradition, and ample materials on the ‘stages of the path’ meditations. Sessions are led by Venerable Lobsang Tenpa and Venerable Thubten Tenzin, who were invited by the Song River Dharma Ashram. To register, email us at lobsangtenpa@icloud.com. You will receive a registration form and further details. — Be a Buddhist, which means that prior to the retreat you should take refuge in the Buddha, Dharma and Sangha, completely entrusting yourself to the Buddhist path and taking the refuge commitment. — Be of stable mental health, with no recent instances of mental disorders. Prior to the retreat all retreatants will have to speak to the retreat leaders. — Have certain experience of studying and practicing the lamrim (graduated path to enlightenment). This includes both studying the lamrim teachings and applying them in meditation. Suggestions for personal study are given below. — If you have personal teachers, talk to them to see whether the time is right for you to be doing this retreat. — Come to the retreat with a very strong intention to do it in full! Please understand that retreat is not a holiday; it is hard intense work which requires strong motivation and condidence which will be required to deal with difficulties that will inevitably arise. — Read all the information on the retreat, discipline rules and maintaing silence and agree to follow the retreat discipline. If somebody’s behaior starts to disturb the group Song River Dharma Ashram’s management reserves the right to ask the person to leave the center. Participants should arrive to the retreat center no lager that in the first half of January 23. Retreat will begin at 6pm January 23 with a session of explanations and the first evening session of practice (which will be opening the retreat) and will be completed on April 23 with a Dorje Khadro fire puja. Since this is a group retreat, your presence in the group and your support of other practitioners are crucial for the retreat be a postive experience for everyone. For this reason you will remain in retreat for the whole duration of three months even if you complete your mantra accumulation earlier. Запись опубликована Июль 21, 2014 автором Shantideva в рубрике Учения.